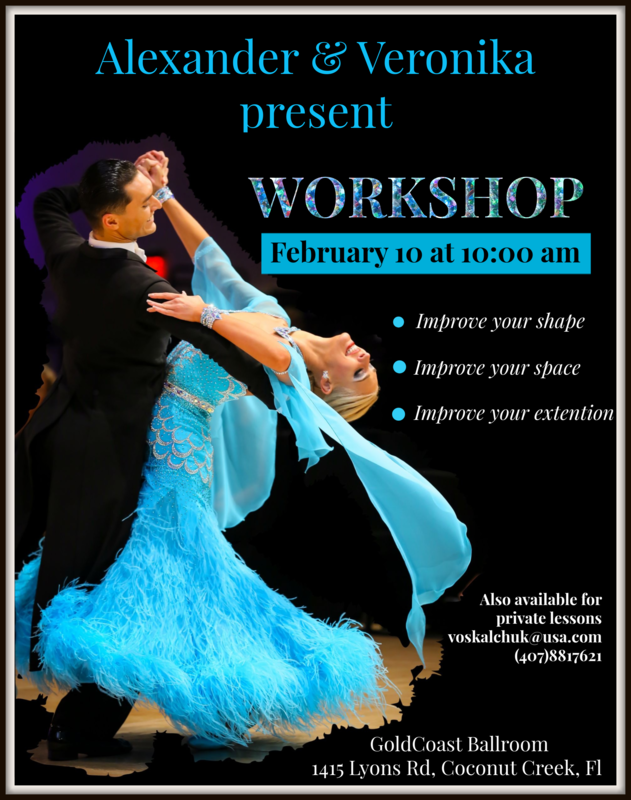 Goldcoast Ballroom & Event Center | SPECIAL WORKSHOP – ‘IMPROVE YOUR SHAPE, IMPROVE YOUR SPACE, IMPROVE YOUR EXTENSION’ – 10:00 AM – 11:00 AM – with US Open Professional Champions ALEXANDER & VERONIKA VOSKALCHUK!! – $20 per person; $30 per couple – Also Available for Private Lessons! – Call (813) 966-5438 to schedule! SPECIAL WORKSHOP – ‘IMPROVE YOUR SHAPE, IMPROVE YOUR SPACE, IMPROVE YOUR EXTENSION’ – 10:00 AM – 11:00 AM – with US Open Professional Champions ALEXANDER & VERONIKA VOSKALCHUK!! – $20 per person; $30 per couple – Also Available for Private Lessons! – Call (813) 966-5438 to schedule! U.S. Open Professional Ballroom Champions! 10:00 AM – 11:00 AM! !